In a march outside Angola State Prison, “Last Slave Plantation” is painted on the asphalt near the initials LSP for Louisiana State Penitentiary. Prison guards block the road, as signs wave demanding the release of the Angola 3: Albert Woodfox, Herman Wallace and Robert King Wilkerson. In February 2001, Robert King walks out a free man, all charges dropped. Who would have known, who could have predicted this man’s life was destined to take the turns it did – not for any particular misdeed; rather, his captivity was based solely on prejudicial perceptions that labeled him and other Black, poor boys and men, then and now, unworthy, criminal. Freedom was a notion many in his community claimed but few knew because of the politically racist policies of the Deep South. Yet, despite all this, the child, Robert Hillary King, found a home and a grandmother and a community where not only was he welcomed, he was loved too. Sheltered from the travesties of Jim Crow – segregation and deprivation – he took the lean days in stride with the fat. Even when accused, picked up and booked, not once, but three times, the first while just a child for crimes he hadn’t committed, King retained his optimism and belief in the human race. One would think, later on, after 29 years in solitary confinement with charges which were all eventually dropped, he might carry some bitterness, righteous anger for irretrievable time lost – 31 years – but he doesn’t. If anything, his anger is at a system, what he calls a post-colonial system which sanctions the disenfranchisement of certain people – 500 years after the first Africans disembarked on American shores. Robert Hillary King a.k.a. Robert King Wilkerson takes us on a lyrical journey “From the Bottom of the Heap” to the depths of a darkness so dense flashlights can’t pierce the intangible conscience or sensibility of a nation or a people who would subject another citizen to what King describes in his autobiography as a normal state of affairs for Black men pre-Civil Rights Act, pre-March on Washington, pre-Black Panther Party for Self-Defense. Told in a straightforward manner, this gripping tale has humor and all the innocence of a child’s voice, a more mature young man’s, evolving finally into the voice of an adult trying to plant his flag in ripe soil to claim a piece of the planet for himself and his kin. Unlike Ralph Ellison’s protagonist, King doesn’t evaporate or melt into the darkness. He fights, he yells, he refuses to take the beatings, whether ideologically or physically. He never gives up hope. It’s amazing that King actually believed in the judicial system; he believed in it up to the third time he was thrown into the Parish Prison and was looking at 35 years to life. It was at this time, when he realized that the court was just interested in closing cases, not in justice, that he “felt psychologically whole.” King felt that if he didn’t act on this “new consciousness” it would be a betrayal of his sanity, so he and 60 other “brothers in jail who also felt this need to appeal to no one but themselves, where freedom was concerned,” planned an escape (156-157). King stayed at large for a couple of weeks and though he was returned to the New Orleans Parish Prison with eight additional years added to his 35-year sentence, he no longer masked his reality with religion or other opiates. He says, “In studying and learning of my enemy, I also learned of myself, my place in history. In learning of my place in history, I rediscovered my long lost humanity. Individuality was replaced with the need for unity. “I saw that all are expendable at the system’s whim. I saw how my mother, her mother and her mother’s mother before her suffered. I saw past generations of my forefathers stripped from their homeland, brought by force, to these shores in chains” (169). It is here King recognizes his piece on the game board and steps off the table – refusing to play anymore. He’d heard about the shooting on Desire Street in New Orleans between the police and the Black Panther Party – several members also jailed at New Orleans Parish Prison – both men and women. During this time he is introduced to the BPP and sees in it the answers to so many questions he’d had before. He says, “Certainty replaced uncertainty” and despite the tragic loss of his 5-year-old son, Robert Jr., due to medical malpractice and the loss of his physical freedom, King seems to have gained a lot more than he lost. King is shipped briefly to Angola again, returned to Parish Prison in 1971, and then shipped back to Angola for good in 1972, where he was charged with investigation into the death of a prison guard, a death that happened before he arrived back at Angola. Herman Wallace, Albert Woodfox and Gilbert Montegut were also tried. Woodfox has been cleared of the charges brought in 1972 and is presently awaiting release. Wallace’s case is on appeal to the Louisiana State Supreme Court. 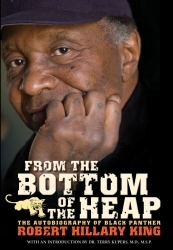 “From the Bottom of the Heap” is the story of one man, yet it could be the story of a nation – from Jim Crow to Hip Hop, the strategic targeting of Black youth, the criminalizing of persons based solely on the color of their skin, the content of their wallets and the address of their parents. This story is the answer leaders today need to hear – it is a voice no one is listening too. The same economic circumstances which made it impossible to feed one’s family 50, 60 years ago exist today. The public education system is just as inadequate now as it was then in preparing future generations for occupations that will support their families. In fact, the situation today might be worse. The end of the book shifts and changes tone: There are letters, a poem, a chronology of the Angola 3, more thanks, a family tree and an ad for Freelines – King’s sweet confection first made in prison. When one thinks of a second coming, Robert Hillary King comes to mind – he says he was reborn Feb. 8, 2001. Like a phoenix rising from the ashes, after so much loss, so much death, the ashes serve as fertilizer for a brighter today and tomorrow. King hasn’t walked on water yet, but I’m sure he could if he wanted to. If ever a child was born without a chance, it was this bright light – Robert King, on May 30, 1942 – this child born of descendents of former slaves in Gonzales, Louisiana. Yet, as long as he had lungs, this boy, later man, was not going down without a noise. And it is this noise, this shaking at the gates of justice, rattling the consciences of fellow Americans, that earned him his freedom and will earn his comrades Herman Wallace and Albert Woodfox theirs too. Bay View Arts Editor Wanda Sabir can be reached at wsab1@aol.com. Visit her website and blog at www.wandaspicks.com for an expanded version of Wanda’s Picks, her photos and her radio show. To learn more about the Angola 3, visit www.Angola3.org, www.3blackpanthers.org and www.A3grassroots.org.